On a day which saw the South Carolina-LSU contest moved from Columbia to Baton Rouge, Steve Spurrier's team carried on with their preparations for the game. The health of signal-caller Lorenzo Nunez has been a question mark. The true freshman out of Georgia suffered a shoulder injury during last week's loss to Missouri. 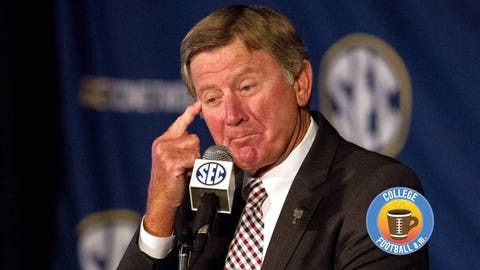 According to Spurrier, he should be fine to play against the Tigers. The injury news is also positive on Alan Knott and Brandon Wilds. Both starters at the beginning of the year, each has been plagued by injury for the duration of this campaign. Knott's potential availability will surely help matters up front along the offensive line. Freshman Zack Bailey filled in admirably for Knott, and will see time regardless. Wilds' rib injury is still somewhat of a concern. While he isn't fully healthy, his appearance in the South Carolina backfield will be a welcomed sight. Wilds feels the injury “from a breath to a turn. Anything.” Additionally, it's felt when “reaching over and lifting something. I'm just rehabbing, getting treatment every day. There's a couple of ways of getting my muscles back together. So it's getting better,” said Wilds.